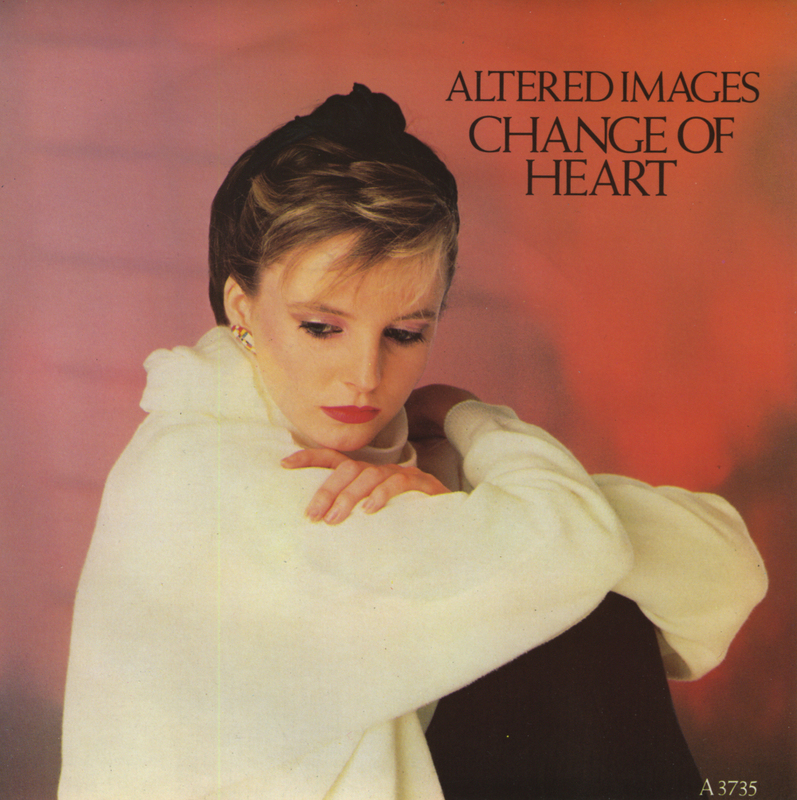 The last single to be released by Altered Images was 'Change of heart', taken from their third album 'Bite'. Although that album reached the UK album top 20, it sold less than the two previous albums. Following a concert tour, the band decided to break up. Clare Grogan and Steve Lironi formed Universal Love School, performing live together but never releasing any recordings. Eventually they got married and lived happily ever after! This 12" single of Altered Images's most successful single 'Don't talk to me about love' contains an impressive 8 minute 30 seconds version of the track. And I say 'most successful', as it was the only single by the UK band to have almost made it into the Dutch Top 40. 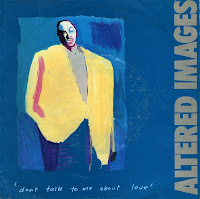 'Don't talk to me about love' is included on a lot of Eighties compilation albums, but this extended version remains a rarity. If this song sounds familiar to you, then most probably you're reminded of the original version of 'Song sung blue' by Neil Diamond, recorded in 1972. It was a number 1 hit in the USA, also reaching number 14 in the UK singles chart. 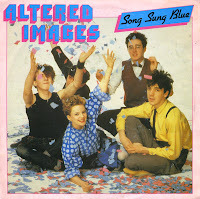 After being championed by legendary DJ John Peel, Altered Images quickly garnered enough attention to be offered a record deal with Epic Records in 1981. Mainstream success eluded the band until their third single 'Happy birthday' was released. 'Dead pop stars', their debut single, reached a lowly number 67 in the UK singles chart, but this second single 'A day's wait' did not chart at all. 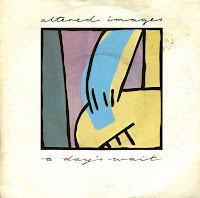 It was after this single that Altered Images recorded their debut album. 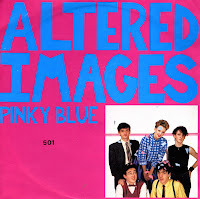 Taken from Altered Images' second album of the same name, 'Pinky blue' was the first single not to hit the top 10 after a hattrick of three singles that did. Released in May 1982, the track was not so different from previous Altered Images singles - but that may have been the problem of course. The girlish voice of Clare Grogan never fails to make me feel optimistic and happy again. I'm just sorry that I missed her on the Here and Now tour this month, but I couldn't get to the UK this time around. Hopefully she'll appear live one more time not too far from now. 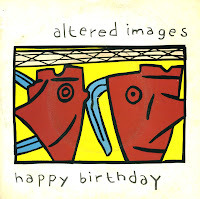 For twenty years, this was the only song by Altered Images I knew. It landed in the Dutch 'bubbling under' chart in June 1983, but failed to make the Top 40. 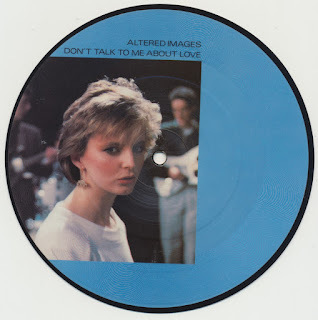 I thought it was an interesting track, with Clare Grogan's peculiar voice as one of its standout traits. In the UK, 'Don't talk to me about love' peaked at number 7, making it one of their best known tracks. 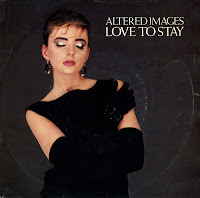 'Love to stay' was the third single from Altered Images' 1983 album 'Bite' and also their penultimate single. It was their first single since 1981's 'A day's wait' that didn't reach the UK top 40, halting at number 46. It is one of their more polished-sounding singles, thanks to Mike Chapman, who produced the track. 'Happy Birthday' was Altered Images' biggest hit, reaching number 2 in the UK singles chart in the autumn of 1981. It was the third single taken from the album of the same name. 'Happy Birthday' was later included in the soundtrack to the John Hughes movie 'Sixteen Candles' (1984). I bought this single as one of three Altered Images singles in December 2002, while I was following the Here and Now Tour in the UK. This was one of the tracks performed live by Clare Grogan, and one of those instantly hummable tunes you either love or loathe. In my case, I loved it. During the Here and Now Tour 2002 I saw Altered Images, or rather Clare Grogan, live in concert and immediately liked the songs she was performing. So I went to the nearest record shop in London and found 'I could be happy' and this single. I didn't know this song - she hadn't performed it - but the sleeve looked interesting enough and so I decided to buy it anyway. It's one of those instances where you are a little too impulsive. 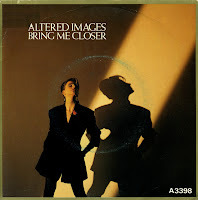 'Bring me closer' is a rather directionless song, and really doesn't end up anywhere. The same goes for the B-side. Clare Grogan's typical voice sounds a bit weird in these tracks. So not one of my most prized possessions this single. But it is a nice sleeve. Altered Images released their second album 'Pinky blue' after a successful headlining tour, in 1982. 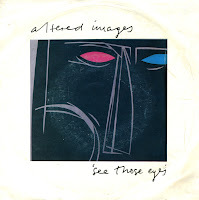 The album provided them with two top 20 hits in the UK: 'See those eyes' and 'I could be happy'. Since the band were going down a pop path, many critics who supported them before started to turn sour. 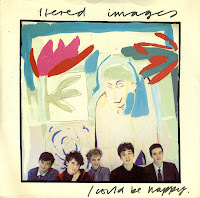 'I could be happy' is an infectious song, and for me it's one of Altered Images's standout tracks. 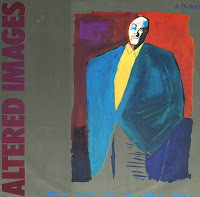 I was very late discovering Altered Images. I did buy 'Don't talk to me about love' somewhere in the eighties, but I never realised they did much more than that until singer Clare Grogan joined the 2002 Here & Now Tour, and I got to hear a selection of their tracks live. 'See those eyes' was one of them. So naturally, when the chance presented itself, I snapped up the single. That happened in 2004.